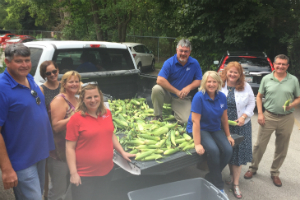 State Senator Laura Murphy (D - Des Plaines) worked with the Mercer County Farm Bureau and the IL Farm Bureau to organize the donation of a pickup tuck full of sweet corn from Mercer County IL to needy families in the 28th District. Murphy participates in the Illinois Farm Bureau's "Adopt-a-Legislator" program, which allows downstate and rural county farm bureaus to "adpot" Chicago and suburban lawmakers to educate them about the needs and desires of the State's Farmers. Murphy's adopted Farm Bureau comes from Mercer County, a western Illinois country bordering the Mississippi River. The corn was donated to Catholic Charities in Des Plaines, the Des Plaines Self Help Closet and Pantry and the Schaumburg Barn Senior Center. 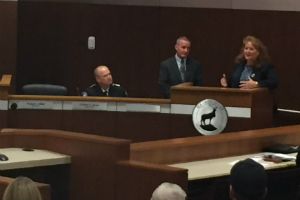 State Senator Laura Murphy (D - Des Plaines) visited the Elk Grove Village Board on Tuesday to commend them for the efforts in passing crucial public health legislation, both locally and statewide. Senator Murphy was a proud sponsor of the legislation in Springfield known as "Tobacco 21," which prohibits the sale of tobacco products to people under the age of 21. Elk Grove Village had passed a similar law in 2017. "If it weren’t for the efforts of the Elk Grove Village Board passing an ordinance last year to prohibit the sale of tobacco products to people under the age of 21, the statewide legislation may never have had the legs to make it through both chambers and onto the Governor’s desk," Murphy said. "Anyone who cares about public health in their community should be grateful for local governments like Elk Grove Village proving that a measure like this is viable statewide." Murphy also praised the Elk Grove Village Board for implementing a program known as Elk Grove Village Cares, a program meant to curb the opioid epidemic running rampant in Illinois by providing information and help to people who are in need of it. "The Elk Grove Village Cares program's unique approach to helping people addicted to drugs by providing compassion for, treatment of and information about their addictions is an extremely simple, cost effective way to confront the opioid crisis that is plaguing our nation, our state, and our communities head on," Murphy said. Murphy spoke at a Village board meeting in front of Elk Grove Village Mayor Craig Johnson, Elk Grove Village Trustees and local citizens. 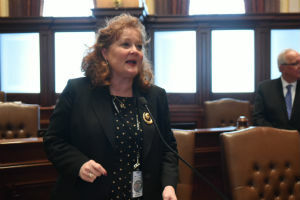 SPRINGFIELD – A new law sponsored by State Senator Laura Murphy (D – Des Plaines) allows veterans to receive property tax exemptions even if they did not occupy their residence at the start of the year. Under current law, disabled veterans can receive property tax exemptions in the amounts of $2,500, $5,000 or complete exemption from taxation, depending on their level of disability, but if the veteran is not an occupant of the residence as of Jan. 1 of an applicable tax year, they are not entitled to any exemptions for that tax year. Senate Bill 2306 allows veterans who move into new residences after Jan. 1 to receive prorated exemptions based on the date of their occupation. The legislation passed through both chambers of the General Assembly with bipartisan support and is effective immediately. 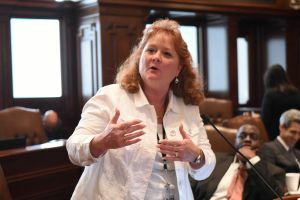 DES PLAINES — A new law sponsored by State Senator Laura Murphy (D-Des Plaines) requires the governor to appoint two individuals with intellectual or developmental disabilities to the Illinois Workforce Innovation Board. The Illinois Workforce Innovation Board seeks to evaluate and meet Illinois’ workforce needs. It includes a variety of members from the public and private sector who represent the interests of the business community, workers and educational field. Senate Bill 3222 requires the governor to appoint two individuals who self-identify as individuals with intellectual or developmental disabilities who are advocates for the rights of individuals with disabilities to the Illinois Workforce Innovation Board. Currently, nearly 50 members serve on the board. According to theUnited States Census Bureau, about 7 percent of Illinoisans under the age of 65 have a disability. This legislation, which was signed into law yesterday, takes effect immediately.